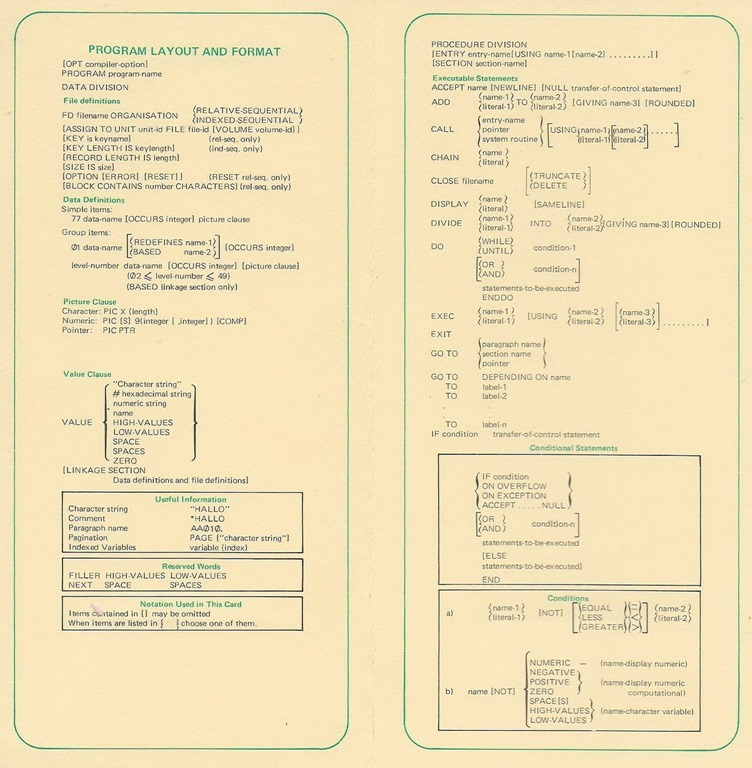 And in today’s lunchtime blast from the past: a Summary Card for the programming language MicroCobol from my very first job as a programmer. “Do what?,” I can hear my developer audience from here. 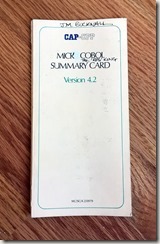 “WTF is MicroCobol?” Well, sit yourself comfortably and listen up. After getting my degree in Mathematics, I decided that the programming life was for me. I joined a company called CAP-CPP (the CAP stood for “Computer Analysts and Programmers” but the CPP bit eludes me), and they immediately put us on an intro course on how to properly develop programs, and how to do so in their Very Own Programming Language, which was called MicroCobol. 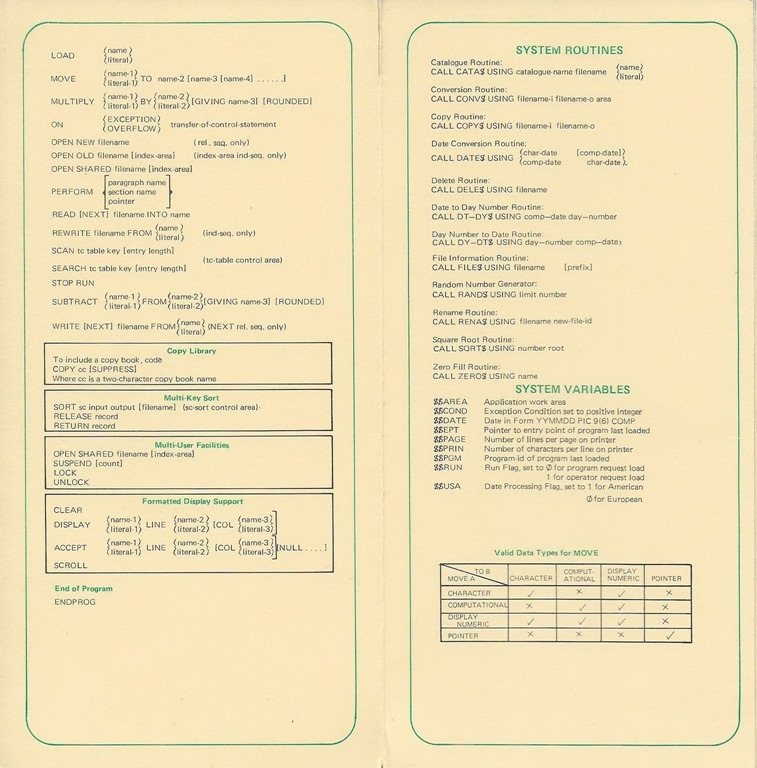 It ran on a DEC PDP 11 using an OS called BOS, or Business Operating System. Both had been developed internally by CAP. 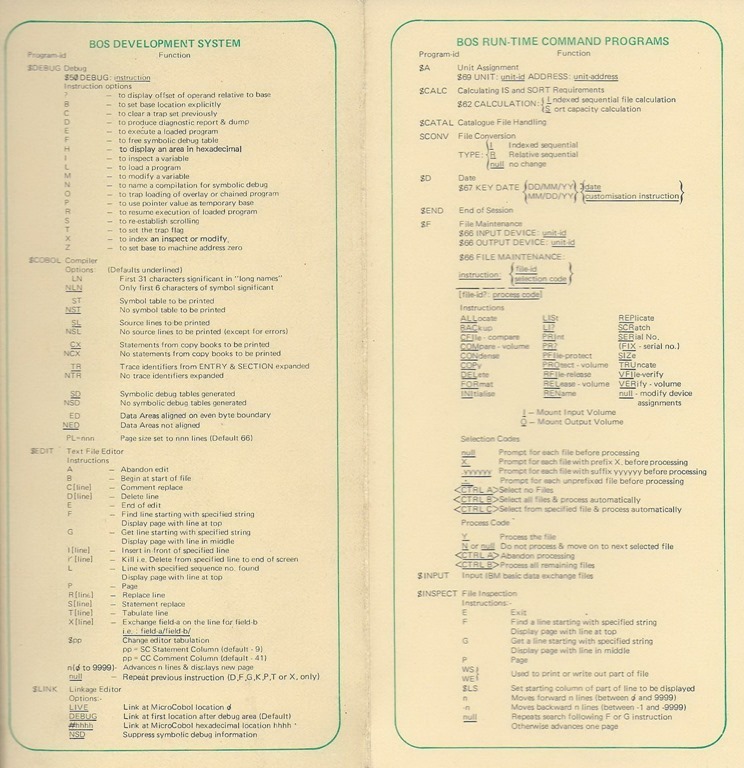 Anyway, to help out with learning and programming this language/OS, we were given a cheat sheet, a foldable Summary Card of the commands and whatnot that BOS and MicroCobol used. And here it is in all its glory. I will state here and now that I think I only did one project for a customer in MicroCobol. 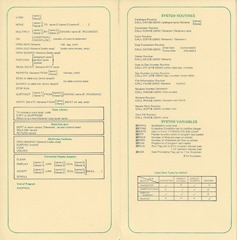 Terry Allen (who started at CAP at the same time as I did, this was a year or so later) and I had to write something for some customer (no recollection of any details at this remove), and we rebelled by writing it as if it were in RPG II, a language we both preferred to MicroCobol. 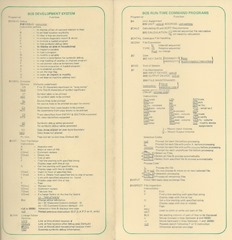 So we reinvented the RPG program cycle, the indicators, and what have you, and pretended that MicroCobol was RPG II. God only knows if anyone else had to maintain that app afterwards (and if so I hope God helped them do so). 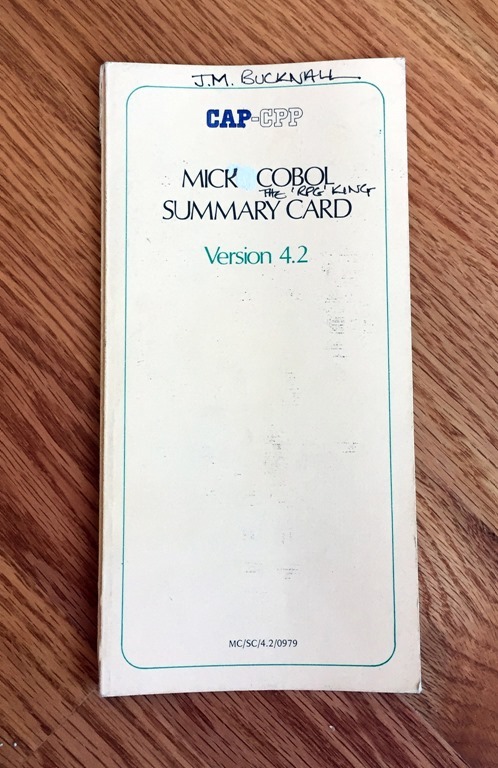 As you can see, as part of my rebellion, I decided to edit the front of this card as if it were the Summary Card for Mick Cobol, the RPG King. 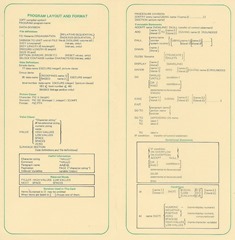 At some time in the not too distant future, I’ll post images of the cheat sheet for RPG. It is a hoot.